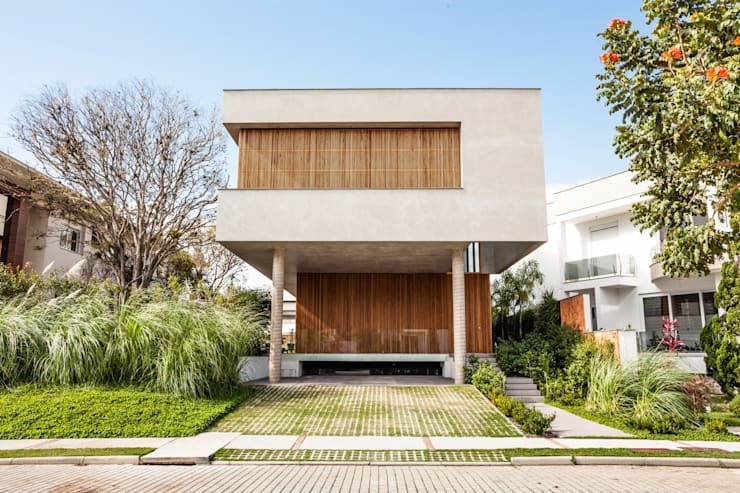 This stunning home, courtesy of the creatives at Brazil's MarchettiBonetti+ Architects, presents a striking, geometric facade constructed of rendered concrete and timber slats, behind which lies a host of hidden treasures. From the outset this abode is sure to catch the eye, with its exterior appearing sleek and contemporary, combining the strength of concrete with the relative fragility of slender, timber slats. Moving through to the interior and we're met with the utmost in modern style, with living dining and kitchen areas all decorated to perfection in a range of luxurious furnishings and engaging artworks. 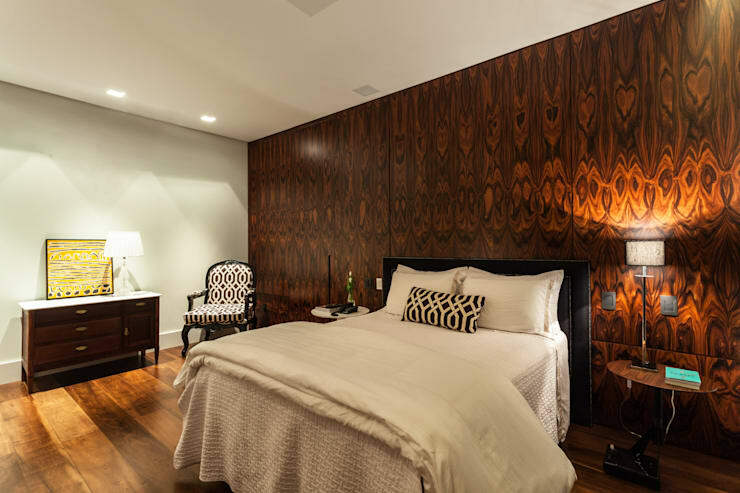 The home's master bedroom oozes understated opulence, with the deep tones of its wooden feature wall infusing the room with a bold sense of style, while the bathroom is dressed in fine marble and mirrored finishes for a stunning effect. Best of all in this lovely dwelling, however, is the expansive area for outdoor living, which comprises outdoor kitchen, dining and living areas with partial cover to suit all weather. This home definitely showcases a design treat for those seeking a combination of aesthetic character and modern artistry. Take a tour below and tell us what you think! 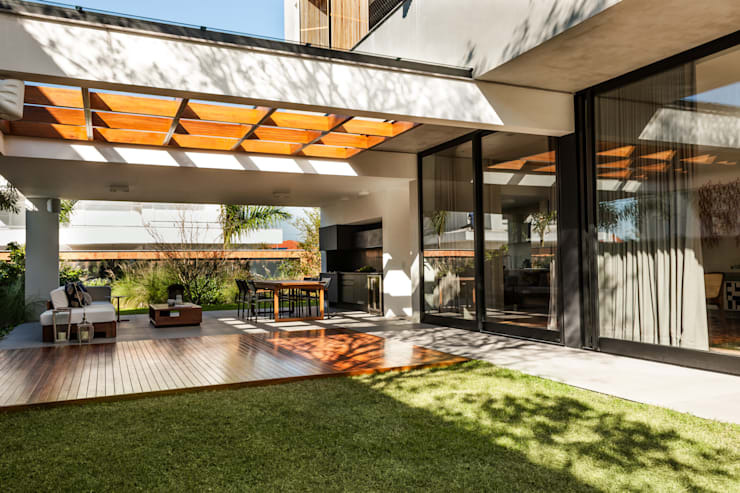 The facade of this brilliant abode bursts out from the street in engaging style, with the smooth texture of rendered concrete contrasting beautifully against sections of slender, timber slats. The vertical slats add a sense of height to the home, while the geometric flow of the concrete defines its form with a soothing sense of strength. In front of the house is a simple garden of green shrubbery, adding the refreshing air of nature to the scene. Moving inside and we're met by a stylishly furnished interior, decorated with a range of luxurious, modern pieces. A beautiful, leather armchair with matching foot stool commands attention within the space, alongside the black sheen of a baby grand piano. 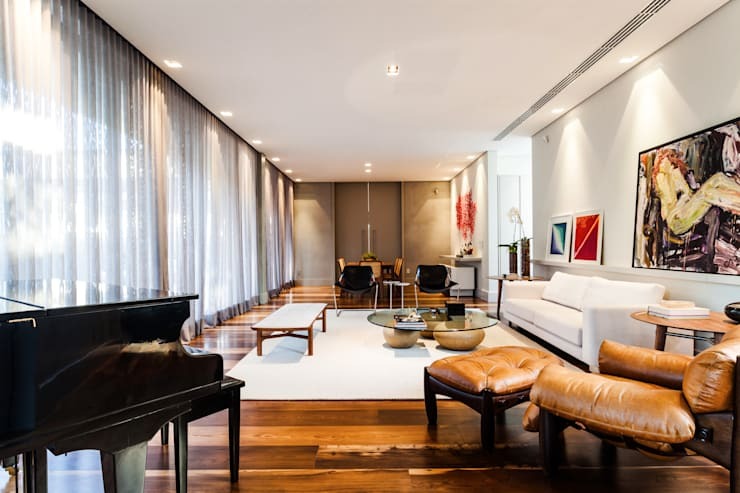 In the distance a crisp, white sofa sits serenely in front of a contemporary coffee table, while an array of modern artworks infuse the room with a unique sense of personality. Best of all, the living space is beautifully lit, with floor-to-ceiling windows bordering the room, inviting sun and air to permeate with ease. Beyond the home's living room is this simple space for dining. 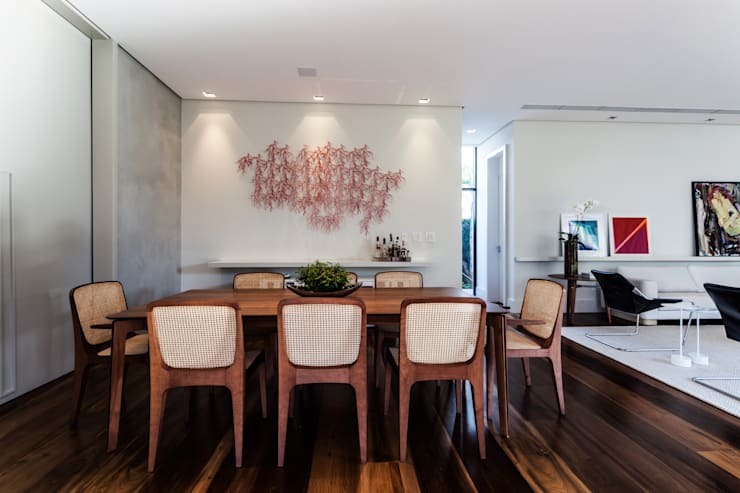 The dining table and chairs are modern yet understated in design, providing an aesthetic contrast relative to the bold furnishings of the living room, while a 3D artwork adorns the wall, catching the eye and spicing up the decor. 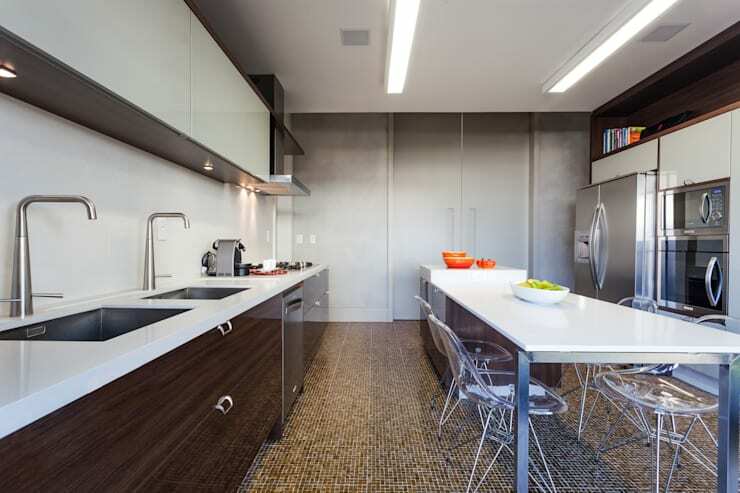 The home's kitchen exudes all the enviable style of the living and dining spaces, with the sheen of white and silver finishes infusing the space with a sophisticated edge. Dark, wood grain storage anchors the room's lighter decor, while a cleverly designed kitchen island rests central, flowing across the room and transforming into a simple space for casual dining. The home's master bedroom rests resplendent, with the deep tones of its wooden feature wall glowing from behind the bed. Timber panels also flow underfoot, while the remainder of the room's decor has been dressed in a muted palette. A luxurious bed sits central, surrounding by a small array of classically designed furnishings, each with a modern edge, such as the small armchair seen here decorated in bold, black and white upholstery. 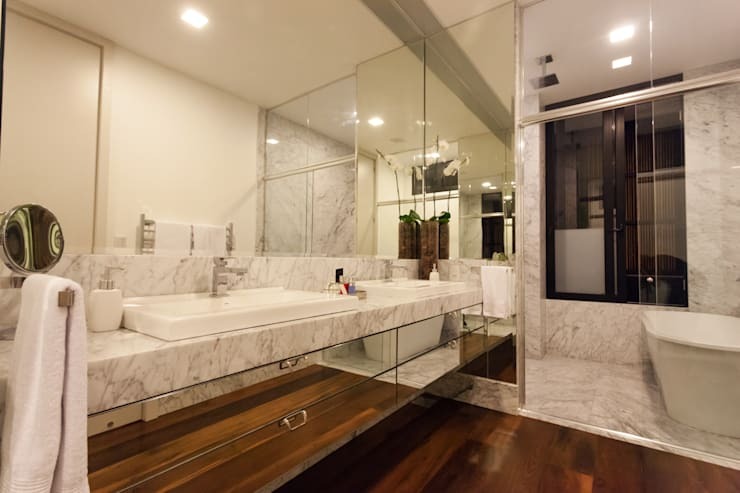 The bathroom of this magnificent property exudes all the elements of modern luxury found in the master bedroom, with the space finished in the opulent combination of mirror and marble. Generous in size, the bathroom comprises twin sinks, a large shower and a bath tub, with plenty of space for the occupants to refresh and relax. Last but not least within this stunning home is a stylish and spacious area for outdoor living, constructed in the privacy of an extensive back yard and comprising multiple elements to encourage relaxation and entertainment. An outdoor kitchen and dining setting sit beneath the shade of a concrete awning, with a chic, couch and coffee table also included to encourage relaxation and casual interactions. Bordering the undercover area is a stretch of beautiful decking, constructed beneath an open, timber frame and providing ample space to soak up some sunshine. Did you like the modern artwork decorating the walls of this stylish home? If so, take a tour of An Apartment of Colour and Character for more artistic inspiration! What's your favourite design feature in this modern masterpiece of a home? Tell us below!